If you’re looking for a quick, one pot meal – this is it! It was perfect meal for the one night I was running late coming home from work and Madeline attacked me as I opened the door because she was SO HUNGARY! Well, 10 minutes later, her requests were answered and dinner was done! She gobbled it up and asked for it for lunch the next day. I’d say that’s a success! 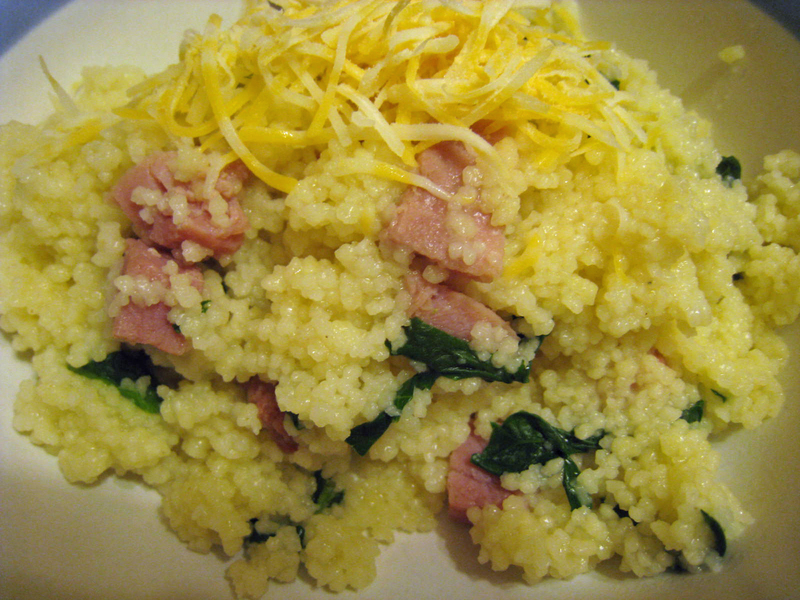 In a large saucepan, combine the water, ham, spinach and garlic salt. Bring to a boil and stir in couscous. Remove from heat, cover and let stand for 5 to 10 minutes or until water is absorbed. Fluff with a fork. Sprinkle with cheese. See I told you it was quick!